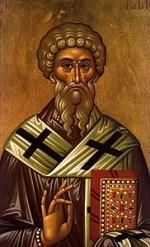 Very few facts are known about Saint Blaise. It is believed that he was a bishop of Sebastea in Armenia who was martyred under the reign of Licinius in the early fourth century. The legend of his life that sprang up in the eighth century tells us that he was born in to a rich and noble family who raised him as a Christian. After becoming a bishop, a new persecution of Christians began. He received a message from God to go into the hills to escape persecution. Men hunting in the mountains discovered a cave surrounded by wild animals who were sick. Among them Blaise walked unafraid, curing them of their illnesses. Recognizing Blaise as a bishop, they captured him to take him back for trial. On the way back, he talked a wolf into releasing a pig that belonged to a poor woman. When Blaise was sentenced to be starved to death, the woman, in gratitude, sneaked into the prison with food and candles. Finally Blaise was killed by the governor. Many Catholics might remember Saint Blaise’s feast day because of the Blessing of the Throats that takes place on this day. Two candles are blessed, held slightly open, and pressed against the throat as the blessing is said. 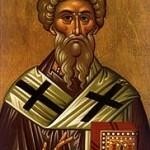 Saint Blaise’s protection of those with throat troubles apparently comes from a legend that a boy was brought to him who had a fishbone stuck in his throat. The boy was about to die when Saint Blaise healed him.